Ahh, Wikipedia. My source for all things verifiable. I’m on LinkedIn. The blog post you are reading is on LinkedIn through the recently launched WordPress application. Meaning, this link, which is to my profile, offers and infinite loop back and forth. I am of the opinion that this will be a good place for new business in trying times. I think that more and more, people will look for connections with the businesses they are willing to partner with. Don’t get me wrong, business will still be won with pitches. I just think that LinkedIn might offer the ability to get in the door. To get introduced. I also think that recommendations are big. Overall, I think that getting and giving recommendations on LinkedIn will increase a company’s profile. But I don’t know that, nor do I know how to test it. Outside of simply going around and recommending some of the people I work with who I think are smart. Which doesn’t mean that if I didn’t recommend them, it means I don’t think they are smart. It means I didn’t work with them – we have lots of peeps at EMA. But, then one wonders about brands. Advertising can be done really well in LinkedIn. 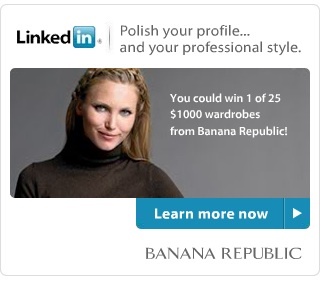 This is Banana Republic on LinkedIn in the profile tab. This takes the user to a contest that demands an update to the profile (good for LinkedIn) and then talks about a real life update to the profile (good for Banana Republic). This is more than a banner ad, this is an interactive thought. Do something you should do anyway and get stuff from Banana Republic. Smart. So I wonder more and more. Outside of advertising, which is a good option, what other good things does LinkedIn have to offer? Since I’m about to really investigate it (for a client), I thought I would start here wondering about it.